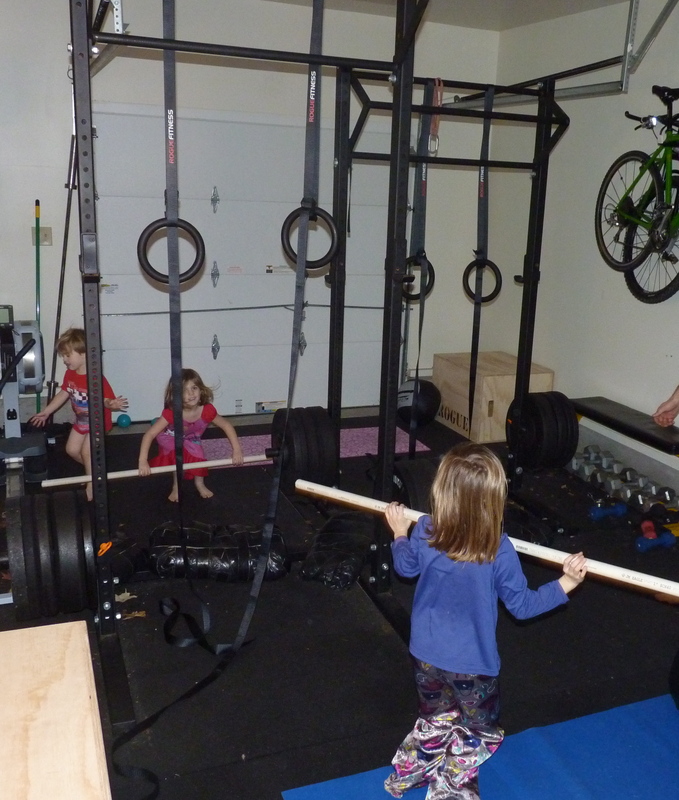 The other day I was busy putting a dumbbell rack together in the garage when my oldest daughter (7) asked if her and her friend could play on the rings. Next thing I know she wrote this on my white board and explained to her friend (who was now looking like she was about to bolt back home any second!) that this was their workout for the day. She asked me for my phone to use as a timer, set up some medicine balls for “kixs”, blasted some Scooter on the iPod, and they were off. I pretended to be super busy with my little project so I didn’t interfere, but I just about teared up at the sight. I realized that although sometimes they wait (or whine!) at the garage door while I’m finishing up a workout, they are actually inspired. They are not just told, but SHOWN that fitness is a vital part of our family. Just another reason to embrace your garage gym, workout in front of your kids, show them some basic movements, let them “play” (supervised, of course!) with your gym equipment, set up some weekend or after school CrossFit kids workouts to do as a family, and get them excited about being fit. Although it starts mostly as play for them it lays a foundation for the rest of their lives. Before you know it they’ll be asking for a pull-up bar and a kettle bell from Santa! I love this heather!! It’s amazing how our lifestyles ail influence our kidos!! Miss you! Yes, it’s great! I remember you telling me about your girls running up and down the steps and when you asked what the commotion was about they said it was part of their WOD 🙂 See you in a few weeks! So freakin’ cool, Heather. Your kids rock! That is just so precious!!! Thanks for sharing that wonderful story. Heather, you and Tyler are an amazing example to your kids and you are sending them an inspiring message by your actions. Keep up the great work! Great article…it’s a wonderful life lesson to know that fitness matters, as well as taking time for yourself. Kudos to you! Thanks, Meg! I didn’t think of it that way earlier but you are exactly right about taking time for yourself too!